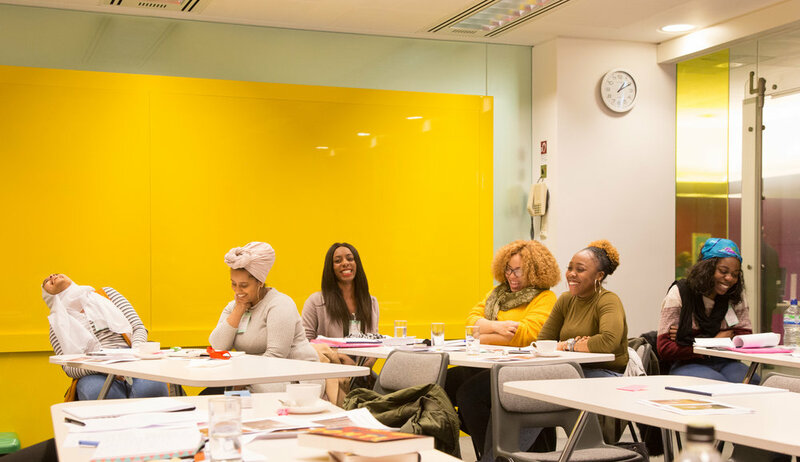 You Make It is an incredible not-for-profit set up by Asma Shah from her kitchen table in order to provide vital training, confidence-building, support and mentoring to women from disadvantaged backgrounds in East London. I first discovered their work whilst looking for mentoring opportunities and our good friend Clo PR kindly put me in touch with the Programme Manager at You Make It, Roxi Jahanshahi. Roxi’s passion, resilience and love for the work she does is infectious and spending just a few minutes with her cemented how essential it is to support women who have suffered prejudice, discrimination, abuse and/or are from impoverished or disadvantaged backgrounds. Nat and I both know how lucky we are to be able to start our own business. We’ve had best-in-class schooling, university degrees and invaluable experience within the advertising industry. In addition, we’ve been incredibly lucky to have amazing female role models via our family, friends, school and work who have encouraged us to believe in ourselves and push the status quo. Since starting our business and from reading, listening and opening our eyes, we’ve become deeply aware that as white women from financially stable backgrounds we have been disproportionately supported by the society we live in, unlike so many others who aren’t fortunate enough to benefit from this inherent privilege. Aside from the obvious responsibility we all have to create action around equality, the facts speak for themselves, as diverse companies are 15% more likely to out-perform and ethnically diverse companies are 35% more likely to outperform. Asma and Roxi’s work is so important, not just as a lifeline for the women they work with, but for the benefit of everyone. However, due to a lack of funding, You Make It is currently under threat of closure and the tight bonds they have built with women in the local communities are under threat of being severed. We are able to use our business platform to amplify these messages to the people we work with, and where better to start contributing than on our own doorstep? So, I’m writing this blog and looking to you our supporters, advocates and friends to champion, promote and donate in order for You Make It to continue to do their amazing and life-changing work. 1. Support the You Make It crowdfunding campaign by donating. Please spend a moment reflecting on any privilege, luck and support you've had, and help out someone who desperately needs their luck to change. Please share on your networks. The more people we reach, the more change we can make. 2. If you’re London-based then attend this inspiring free event with us hosted by You Make It advocates Kiwi Gray, WP Engine and Blup alongside Asma herself on the evening of Wednesday 8th August. Please attend and share your stories, thoughts and experiences of the event to help protect the incredible work You Make It are doing.